Due to increasing traffic flows the extension of transport infrastructure with rail roads and high speed lines is an ongoing process worldwide. Ballastless track systems with concrete slabs are used more and more. Following the first trials in the 1970s and more than four decades of R&D work on ballastless track, the level of development is such that it can be confirmed that ballastless track is suitable for use as an alternative to ballasted track. 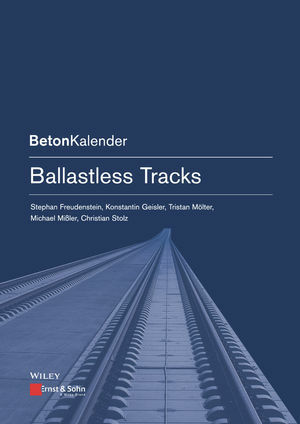 This book makes a contribution to the state of the art of ballastless track by describing the basics for designing the ballastless track. Important advice is provided regarding the construction of ballastless track on earthworks and in tunnels. There is also a description of the technical history of the development of ballastless track on bridges and the ensuing findings for bridge design. The state of the art of ballastless track for switches, important information on details concerning drainage, transitions, accessibility for road vehicles and experience gleaned from maintenance round off the work. The authors are extensively involved in planning, operating and inspecting, designing and testing as well as updating specific rules as well as R&D. Univ.-Prof. Dr.-Ing. Stephan Freudenstein has been a full professor at the Chair and Institute of Road, Railway and Airfield Construction at the Technical University of Munich and director of the test institute of the same name in Pasing, Munich, since 2008. After graduating in civil engineering at TU Munich in 1995 and working at Heilit + Woerner Bau AG, Stephan Freudenstein became a research associate at TU Munich's Chair and Institute of Road, Railway and Airfield Construction in 1997. In 2002 he joined Pfleiderer Infrastrukturtechnik GmbH, now known as RAILONE GmbH, in Neumarkt in der Oberpfalz, Germany. While there, he headed up the technology and development department. He was responsible for prestressed concrete sleepers and the technical side of various ballastless track projects in Germany and farther afield. The main focus of Prof. Freudenstein's research is the structural design of road and rail superstructure systems and aviation surfaces. He is a member of numerous German and European technical standard committees and committees of independent experts. Dr.-Ing. Konstantin Geisler graduated in civil engineering at TU Munich in 2010. He was awarded his doctorate by that university in 2016 and now works in academic research at TU Munich's Chair and Institute of Road, Railway and Airfield Construction. Dipl.-Ing. Tristan Mölter studied civil engineering at TU Darmstadt. Since 1999 he has been responsible for noise control, bridge equipment and provisional bridges at the technology and plant management department of Deutsche Bahn DB Netz AG in Munich. He is the chair of the structural engineering commission (FA KIB) at VDEI (association of German railway engineers) and a member of numerous German and European technical standard committees and committees of independent experts. Dipl.-Ing. Michael Mißler studied civil engineering at TU Darmstadt. As a team leader and project manager he is responsible for the ballastless track technique and track stability at the track technology management dept. of Deutsche Bahn DB Netz AG in Frankfurt on the Main, Germany. He has pushed on the development of ballastless track for Deutsche Bahn since 1999. In the context of his central technical responsibility he is a member of numerous German and European technical standard committees and committees of independent experts. Dipl.-Ing. Christian Stolz studied civil engineering at Cologne's University of Applied Sciences. Since 2010 he has been responsible for ballastless track engineering in the track technology management department of Deutsche Bahn DB Netz AG in Frankfurt/Main, Germany. He is a member of numerous German and European technical standard committees, e.g. DIN Standards Committee Railway NA 087-00-01 AA "Infrastructure", DIN subcommittee "Ballastless track" and CEN TC 256/SC 1/WG 46 "Ballastless Track".